The 6th European Meeting of People Experiencing Poverty took place on 4/5 May 2007 under the German EU Council Presidency in Brussels. The theme was “Progress made, future steps”. It was attended by about 220 people. These included, with the exception of Romania, delegations of people experiencing poverty from all Member States of the European Union, as well as from Norway, but also the German Vice Chancellor and Federal Minister of Labour and Social Affairs Franz Müntefering, the Commissioner for Employment, Social Affairs and Equal Opportunities Vladimir Spidla. Many Member States sent representatives from Ministries of Social Affairs and from Permanent Representations, as well as sending members of the Social Protection Committee (SPC), of the European Parliament, and of the Council of Europe. Over and above this, the Meeting was attended by representatives of non-governmental organisations, the social partners and the academia. The goal of the two-day conference was to take stock and to illustrate how the social situation of people experiencing poverty in the Member States of the European Union has developed since the Meetings started in 2001. Positive everyday experience reflected the significance of the participation of those concerned for the fight against poverty and social exclusion. The delegations drafted concrete statements in workshops on those challenges and priorities of social integration which they consider to be the most urgent, and passed these on in their reports to the attending political representatives of the European institutions and the Member States. In preparation of the conference, EAPN drafted a methodical guide for the national delegations and called on them to visualise their stocktake in three-dimensional objects. These objects made a central contribution towards the content of the conference. They were presented in the plenary over both days and permitted an intensive insight into the problems and perceptions of people experiencing poverty in the Member States. The objects made clear the requirements that are incumbent on the European Social Model. It was easy to see that the factors which lead to poverty and social exclusion are highly similar within the European Union, but that their concrete impact on people’s participation and realisation opportunities may however vary considerably because of social security levels which can differ widely from one case to another. 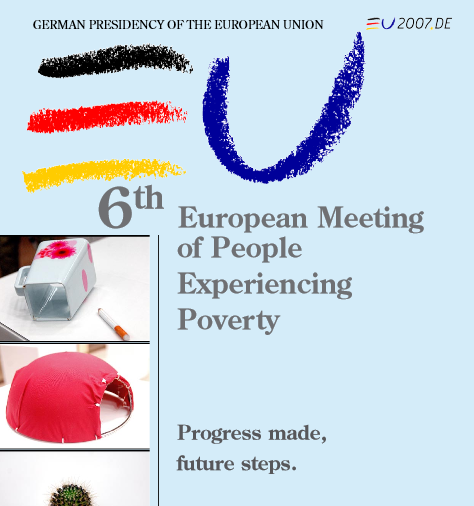 Read the full report of the sixth European meeting of people experiencing poverty which took place on 4th and 5th May 2007 in Brussels under the German Presidency. Watch the film of the 6th Meeting!